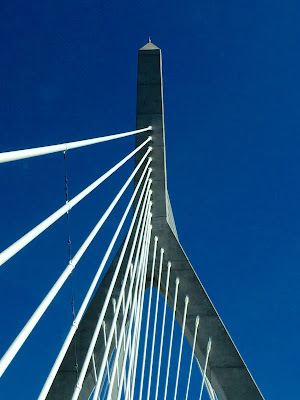 Yesterday's post was a photo that I took of Boston's amazing Zakim Bridge. We were on the way into Boston and I took advantage of being in the passenger's seat and photographed the bridge as we drove over it. 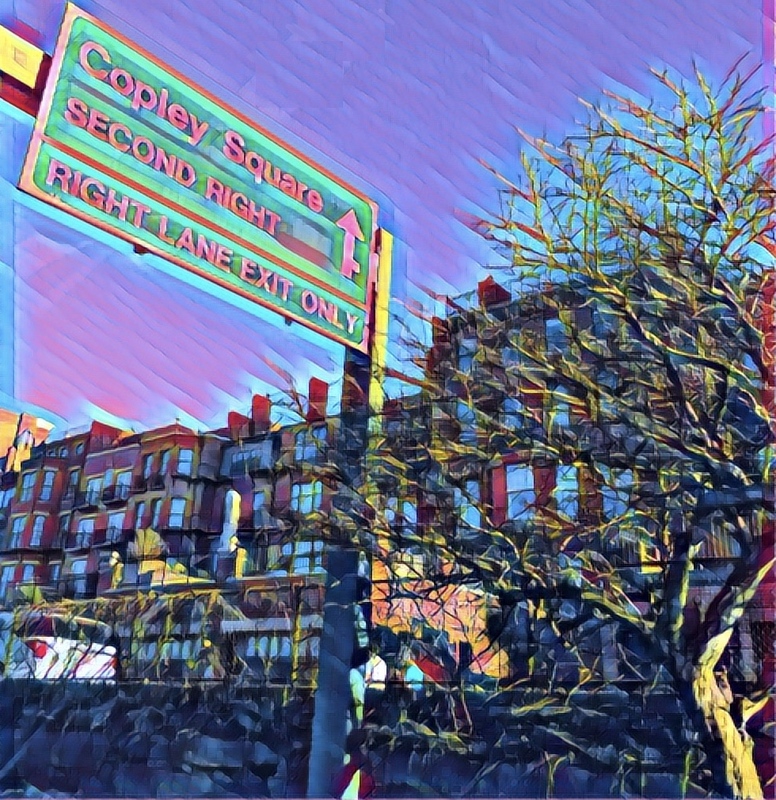 Tonight I am posting the same photo, but this time with a filter from the Prisma app. Look Up, It's the Zakim Bridge! Today's adventure was a trip to Boston. I was in the passenger seat, so I had yet another try at photographing the Zakim Bridge. I think this is the best of the bunch today. I also created another version with a Prisma filter, and plan to post it here tomorrow. 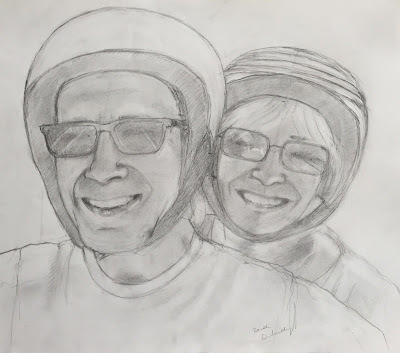 This is the pencil sketch I did as preparation for the portrait I recently finished. (This is based on a vacation photo of this couple riding a motorbike in Greece.) Yesterday I cleaned up the pencil sketch a bit, cropped it, and sent it off with the portrait to its new owners. Here's a last look at "Portrait of Us." Over the past two days (since I pronounced it finished) I have made a lot of very small corrections, fiddling with the background, the helmets, etc. Today I hung it on the wall in my studio and took this "good-bye" picture, just before I wrapped it up and sent it off to its new home. This is the reference photo for the double portrait I have been painting. 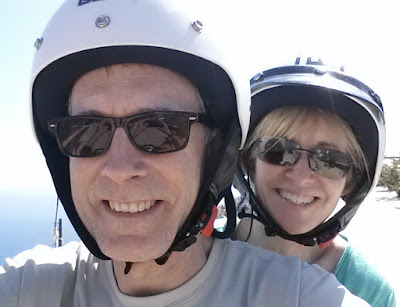 This is a vacation photo of this couple, riding a motorbike on a coast road in Santorini, Greece. Yesterday i pronounced the portrait finished, but I have to admit that I made a few very tiny changes this morning. (I may take one more photo of the painting tomorrow, before I pack it up for delivery.) This photo is an unusual choice for a portrait, but it was chosen because it represents a very happy memory. That's what I like best about this photo and I tried to communicate that in my painting. This is the project I have been working on, a double portrait of a couple on vacation in Santorini, Greece. 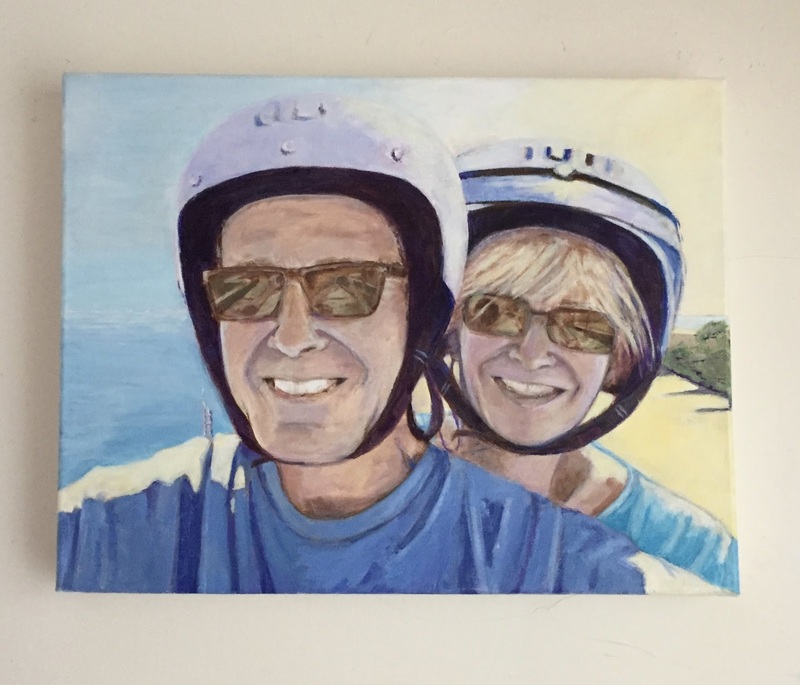 I worked from a vacation photo* that shows them on a motorbike and wearing sunglasses. This is how the painting looked as of yesterday, March 23. Now I am willing to say that it is finished. I am still finding tiny things to fix, on the order of stray marks to cover or lines changed by a sixteenth of an inch. But I know by now: that's just what I do as my time with the painting is ending. So really, it is finished: is signed, sealed, and waiting to be delivered to the clients on Monday. This is the project I having been working on, almost finished in this photo taken two days ago. This is a painting of a couple on vacation in Santorini, Greece. My reference was a vacation photo that showed them riding a motorbike and wearing sunglasses and helmets. 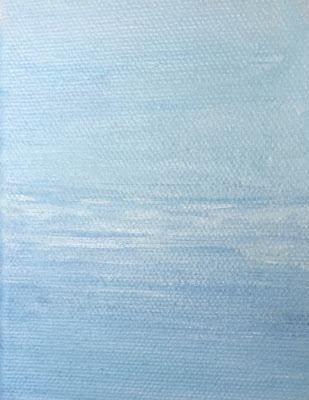 On March 22, I concentrated on "finishing" the painting, by which I mean I tried to make sure no raw canvas was showing through and that lines were smooth and as clean as I could get them. Most of the work was on the background on the right and on the man's shirt. But I also made a lot of very tiny changes on the faces and elsewhere, corrected little mistakes as I went along. Almost there. . . . 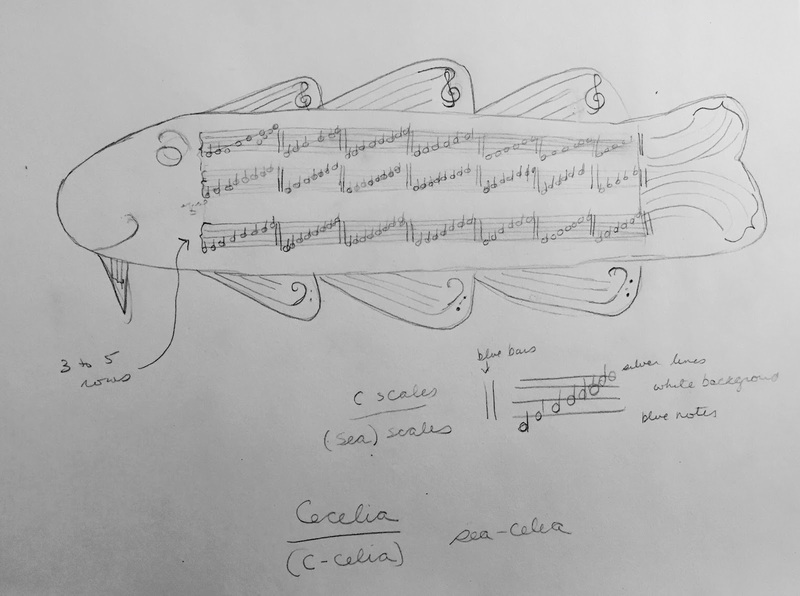 Here is the project I have been working on, as it looked a few days ago (Mar. 21). I am painting a double portrait of this couple, working from one of their vacation photos. In this scene, they are on a motorbike on a coast road in Greece, wearing sunglasses and helmets. I had been trying to decide whether to add details of the helmet buckles, straps, and antenna, so I did a "digital dress rehearsal". (See yesterday's post.) 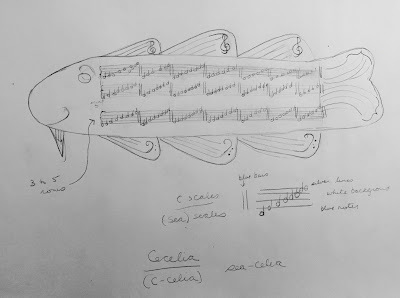 I was happy with the result, so the next day (Tuesday), I added the technical detail, but without a lot of specificity. This is how it looked afterwards. Almost done, just a few things to fix. . . . 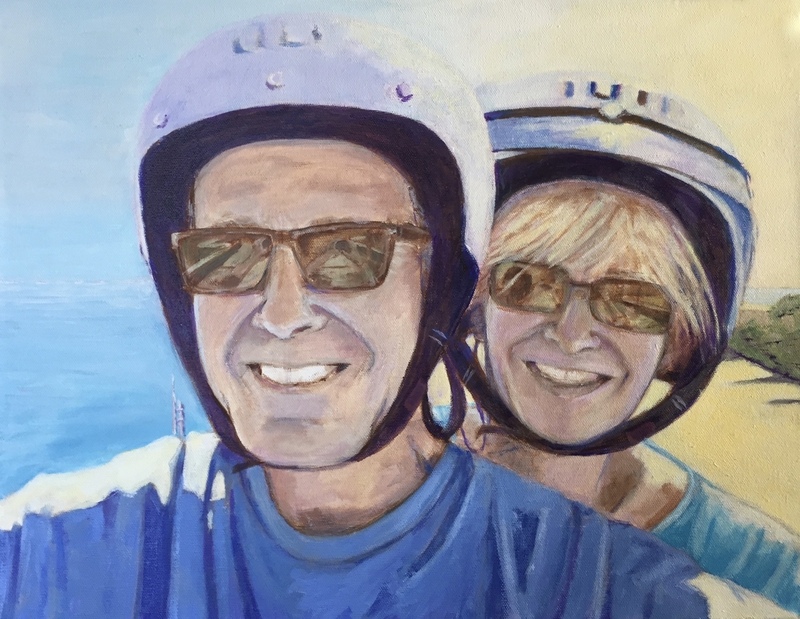 I have been working on this double portrait of a couple riding a motorbike along a coast road in Greece. My reference is their vacation photo. The portrait was nearing completion, but the photo shows more details of the helmets and straps, as well as the motorbike's antenna. I couldn't decide whether or not to add those details. So I used Painter on my computerto create a digital "dress rehearsal" and draw in some of those details with the computer. I did the computer drawing over a jpeg of the portrait. Here is the result. I wasn't looking at the photo at the time, so there are some mistakes in placement, but even so, this little exercise helped me. I decided to I would suggest those details but without being too specific. (I am not going for photorealism after all!) I don't want those details to be more specific than the rest of the painting. I am still finishing up the portrait I have been working on, a painting of a couple on vacation in Greece. 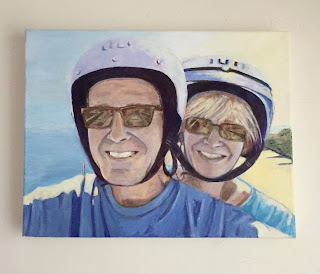 My reference is a vacation photo that shows them on a motorbike on a coast road, and wearing helmets and sunglasses. (See March 16 post for the latest look at it.) I am putting in some background, based on what I can see of the background by zooming in on the photo on my desktop computer, as well as by looking closely at the reflections of the background in the sunglasses. 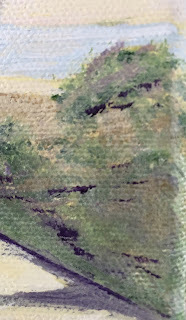 I am trying to capture the background within limited space, it's like making miniature landscape paintings. Yesterday's post was a closeup of the background on the right. Tonight I am posting a closeup of the background on the left. I am working on a double portrait of a couple on vacation in Greece, riding a motorbike along a coast road, and wearing helmets and sunglasses. (See March 16 for the latest look at it.) This a closeup of the background on the right, based on zooming in on the photo and also drawing from the reflections in the sunglasses. I am still working on the portrait, and hoping to finish it this week. 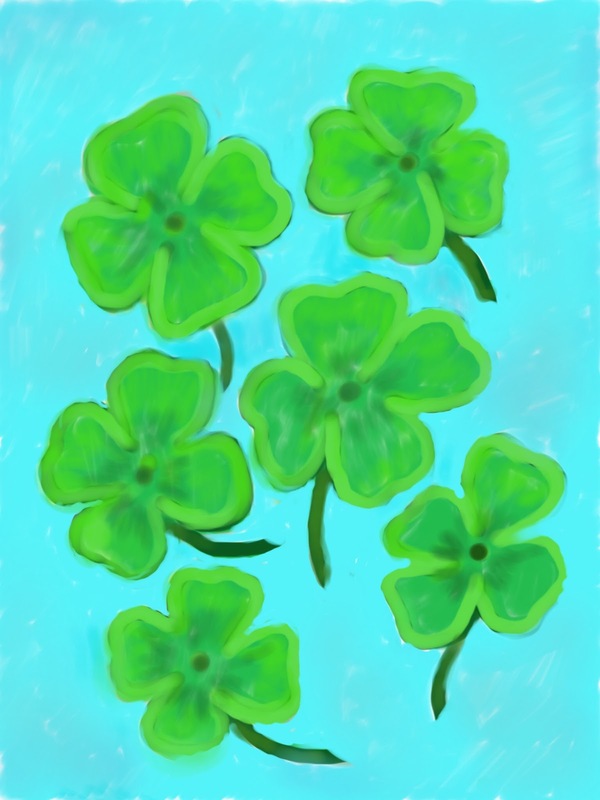 A few days ago, I made a digital drawing of shamrocks, using the Procreate app on my iPad. Today I imported the image into Painter on my desktop. 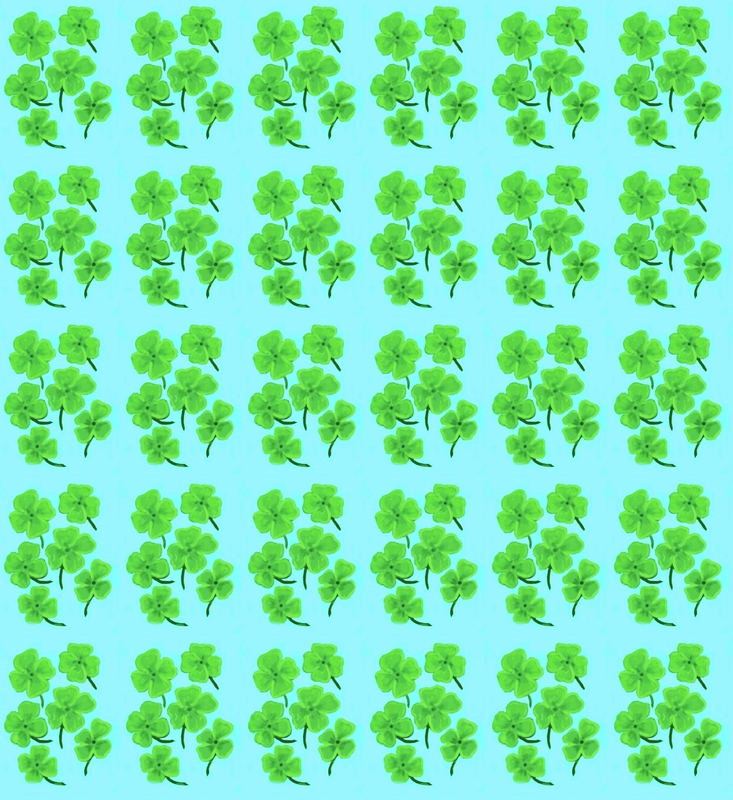 I cleaned up the image and then used it to make this pattern. Yesterday I posted a digital drawing of shamrocks that I made with my new Procreate app on the iPad. 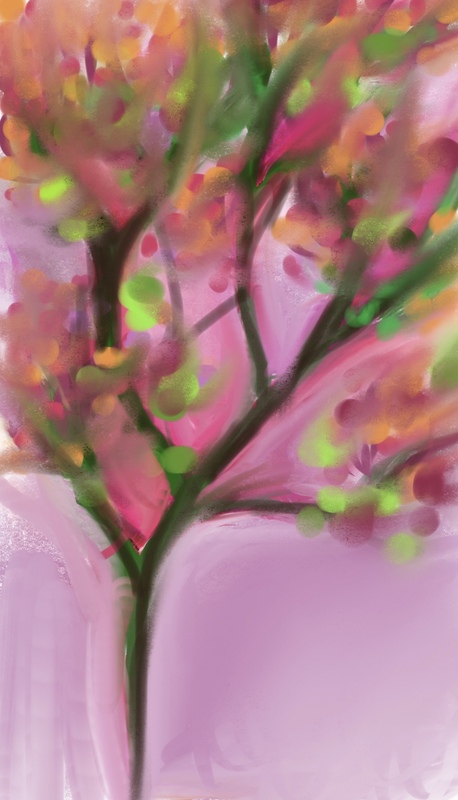 Procreate, like my old Brushes app, also captures every stroke and creates a video. If you want to see it, just press play. It's March 17th and everyone is Irish today! 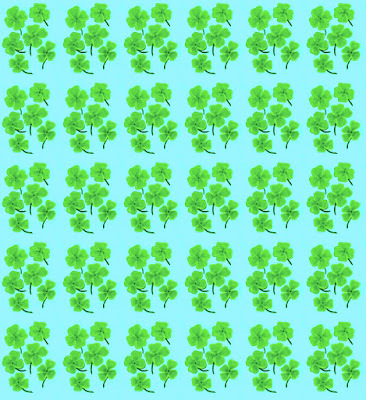 So here are some digital shamrocks that I drew on my new Procreate program for the iPad. I am still learning how everything works, but it feels very natural to draw with a stylus. Procreate captures a video as you draw, and with any luck, I will post that here tomorrow. 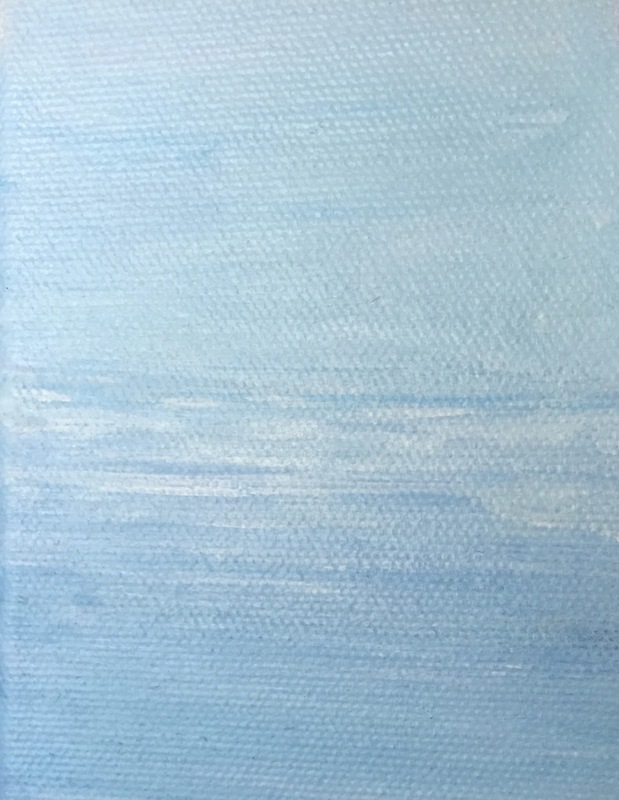 I worked on this painting again this morning. This is a double portrait of a couple on vacation in Greece. I am working from their vacation photo that shows them riding a motorbike along a coast road, wearing helmets and sunglasses. Today I started by lightening the helmet, and then spent the rest of the time on the background, suggesting the horizon on the left, and on the right foliage and a seawall and a bit of ocean in the distance. Here I am using information that is reflected in the sunglasses as well as what I could see when I enlarged the original photo on the computer screen. I am trying to suggest the sense of the place, the strong sunlight, the ocean, the adventure and happiness of the ride. This morning I kept going with this project. This is a portrait of a couple on vacation in Greece. They are riding a motorbike along a coast road, and are wearing helmets and sunglasses. My reference is one of their vacation photos. Today I started by making some adjustments to the lines of the man's helmet. and did some cleanup on the background. I took out a ruler and re-set the horizon line, and then did some work on the foreground on the right. By using the computer to zoom in on the photo, I can get a better idea of what is there, but I can also get a lot of information from the reflection in the sunglasses, which shows a path along a sea wall. I plan to continue with that part of the painting tomorrow. Then there is some cleanup to do, but i am hoping to deliver the finished work next week. I kept going with this painting this morning. I am working on a double portrait of a couple on vacation in Greece. My reference is their vacation photo that shows them riding a motorbike and wearing helmets and sunglasses. Today I made corrections to the lines of the man's shirt, then did some work on the background and the helmets. Every day I see things I need to fix, but still this is pretty close to the finish line. I went back to this project this morning. I have been working on this double portrait of a couple on vacation in Greece. I am working from one of their vacation photos, a picture of them wearing helmets and sunglasses because they are riding a motorbike along a coast road. Today I started by cleaning up the background, made some small changes on the faces, and cleaned up some lines. Then I spent time working on the clothing. There are still some things to fix, but I am hoping to finish this up in the next few weeks. My previous post was a drawing of Hamentaschen (triangular filled cookies eaten on Purim). I created the drawing on my iPad with my new Procreate app. Procreate captures a video while you draw. If you want to watch me make Hamentaschen, just press play. This is a picture of hamentaschen, a filled cookie eaten on the Jewish holiday of Purim. Purim celebrates religious freedom, and it is still relevant today. On Purim, folks wear costumes, listen to the story of Esther, and eat triangular cookies because of the three-cornered hat worn by Haman, villain of the story . Today I used Procreate, my new drawing app, to make this image. I am very much a beginner with this app, so I am still struggling with the controls. Procreate captures a drawing video, which I hope to post here tomorrow. Yesterday I posted a photo that I took during a recent trip to Boston. Here it is again, this time with a filter from my Prisma app. There was a traffic jam on Storrow Drive on the way home. I was in the passenger seat, so I regarded the situation as a photo op. This version doesn't have realistic color, but it is very true to the fun of a ride on Storrow Drive. This image began with a photo that I took on February 23. 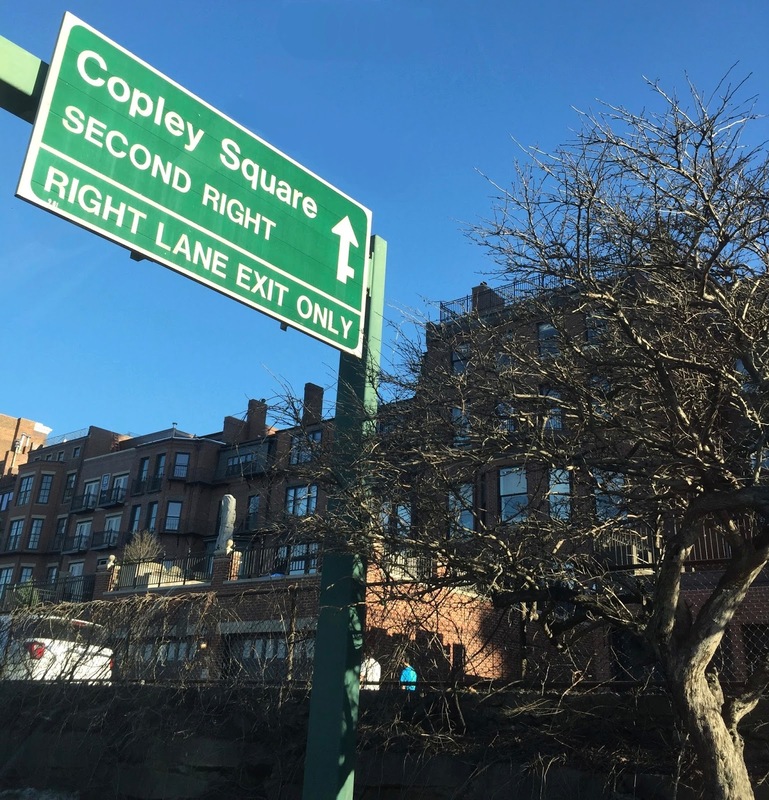 We were heading home from Boston, but got stuck in traffic on Storrow Drive. Luckily, I was in the passenger seat with my iPhone handy. It was a great chance to get some photos of scenery that usually just flashes by. 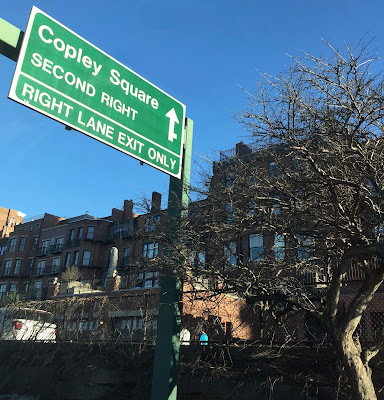 I love the Back Bay architecture, and even the exit sign looked great. Today I did some editing to remove some marks caused by the windshield, then cropped the original to get this composition. I also created another version with a Prisma filter, and I plan to post it here tomorrow. This is the double portrait I have been working on. The setting is Greece, and the action is riding a motorbike on a coast road. I am working from this couple's vacation photo. This morning I went to work on a problem that has been bothering me: the woman's helmet didn't seem to be symmetrical. Today I used some pastel pencil to revise some lines, and after checking in the mirror, I went over the new lines, using brown and white paint. 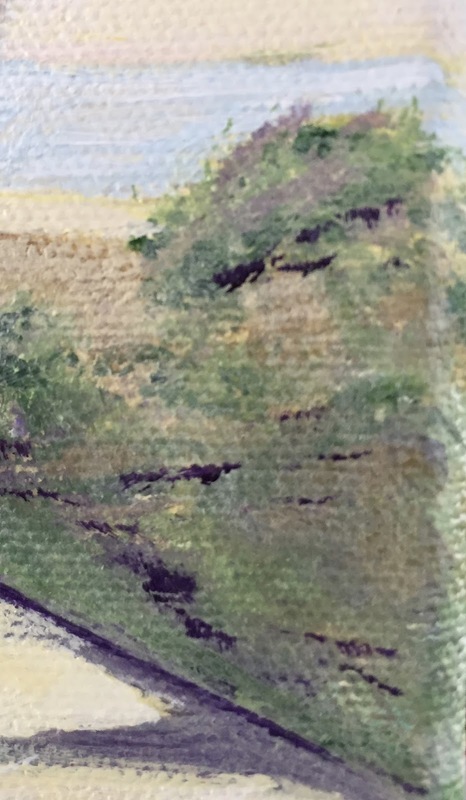 One of the benefits of working on a painting over time is the opportunity to figure out the mistakes, rather than finishing quickly and painting them into the work. I finally had a chance to get back to this project this morning. I am painting this double portrait of this couple, on vacation in Greece. I am working from one of their vacation photos, showing them riding a motorbike in Greece, and wearing helmets and sunglasses. Today I worked on added pink tones to the faces, making some small changes as worked. I also worked on the man's T-shirt. To be continued. . . . Yesterday's post was a photo that I took on February 16th, one of our February snowstorms. Here is the same photo with a filter from my Prisma app. Although the composition is identical in these two images, the mood is very different. This first one is quieter, more natural, and one is much more playful. I have been staying away from my paints for a few days due to a cold, so instead I am catching up with editing some photos. This is a photo I took back on February 16, 2017. I took this picture looking out my back deck at the dogwood and blue spruce. Today I cropped the original photo to get this composition. I also created another version with my Prisma app, and I plan to post that here tomorrow. I haven't had a chance to post this, but this is how this portrait looked on Sunday, Feb. 26. This is the double portrait I am painting. My reference is a vacation photo of this couple, riding a motorbike in Greece, and wearing helmets and sunglasses. Last Sunday, the 26th, I spent most of the time making small changes, especially to the shape of the woman's face. I also straightened out some little problems with the helmets, and started added more pink tones to the faces. Now I can see how this is going to turn out because it is all there; I just have to finish up the foreground and take care of some small details. To be continued. . . .
On Monday, a flat tire in Boston led to several hours spent waiting at the auto dealership to get my tire fixed or replaced. I was very impatient, but decided to draw on my iPhone with my new Procreate program. It was a good way to pass the time, and yesterday I posted the digital drawing that I made. Procreate for iPhone captures a video as you draw, so here it is. You will see quite a struggle as I tried to figure out how to adjust the size of the brushes. But the video has a happy ending, as the "smudge" tool saves the day. On Monday, a trip into Boston turned into frustration when I had a flat tire just before I arrived at Galatea Gallery. So instead of spending several hours there helping to hang the new show, I had to wait in the parking lot for AAA. Then I couldn't really stick around because AAA told me not to drive back home on the 'donut' so I drove to the nearest car dealership to get a 'real' tire. I sat in the dealership waiting room for a long time, getting pretty tired of watching Judge Judy. Then I remembered my new Procreate drawing app on my phone, so I decided to draw. The controls are different from what I am used with Brushes so I struggled with brush size and opacity, and made a lot of mistakes. But I had a lot of fun with the "smudge" tool and it saved the day. I spent about an hour on this little drawing, and it really made the time go by much faster. 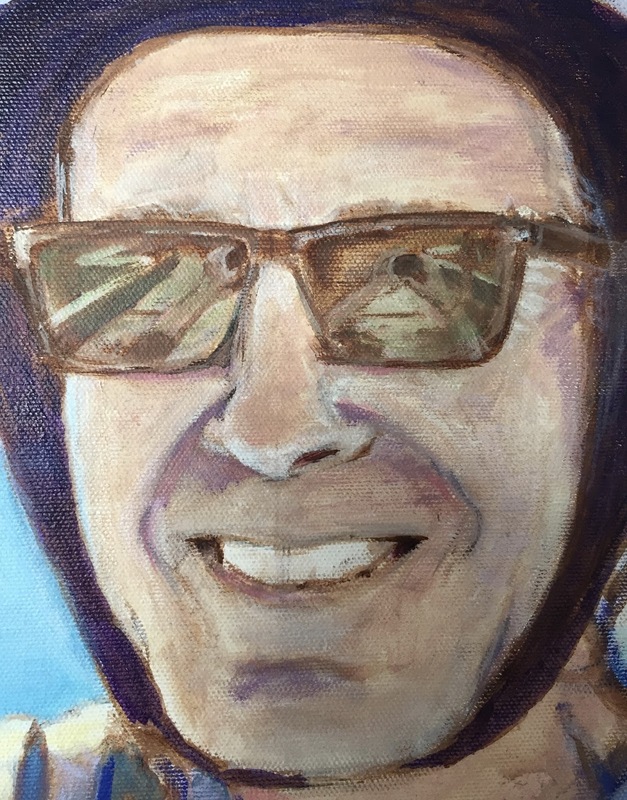 This is another closeup of the portrait I am working on, showing the sunglasses on the guy. This is from a double portrait I am painting of a couple on vacation in Greece, riding a motorbike and wearing helmets and sunglassees. My reference is one of their favorite vacation photos. This shows my efforts to paint the reflections in the sunglasses. I am doing that not only to be faithful to the photo, but also because if you look closely you can see Greece reflected in the sunglasses: the coast road, the vegetation, the sea wall. To be continued. . . .